The Qatar-based cleric and TV star has never been charged in a terrorist attack, but he was labeled a terrorist earlier this month in a formal declaration by Saudi Arabia and three of its allies. The preacher at the center of Qatar's worst-ever diplomatic crisis is a raspy 91-year-old who wears spectacles and no longer stands to give sermons. Yet, to Qatar's Arab neighbors, Yusuf al-Qaradawi is a uniquely dangerous man. The Qatar-based cleric and TV star has never been charged in a terrorist attack, but he was labeled a terrorist earlier this month in a formal declaration by Saudi Arabia and three of its allies. Since then, Gulf Arabs have banned Qaradawi's books, blocked his broadcasts and even sought to remove his name from public buildings. Qaradawi's offense: Inflammatory words, amplified on a Qatar-owned TV network, in a beguiling style likened by one Arab official to a "twisted version of 'The Daily Show.' "
As part of the widening diplomatic feud that began June 5, the Saudi-led bloc is demanding that Qatar take action against 59 individuals and a dozen organizations with alleged ties to terrorists or extremists groups, including al-Qaida-linked militants in Syria and North Africa. In a long list of new demands revealed in a draft proposal on Friday, the countries also ordered Qatar to shut down the Al Jazeera news network and scale back relations with Iran. But the bigger objective may well be to silence figures such as Qaradawi, who ranks No. 19 on the Gulf Arabs' "terrorist" list but surpasses all others in his ability to sway Muslim opinion, according to former and current U.S. officials and Middle East analysts. The Trump administration is currently seeking to serve as mediator in a dispute that officials acknowledge is less about support for groups such as al-Qaida and the Islamic State than about Qatar's friendly ties with Iran and support for the kind of activist Islam embodied by the Muslim Brotherhood movement. To many in the Gulf region, no one better exemplifies the problem than Qaradawi, a man whose beatific smile and folksy speaking style belie a history of defending suicide bombings in Israel and condoning violence against U.S. troops in Iraq, current and former U.S. officials say. U.S. officials also have criticized Qatar for being slow to shut down financial networks used by Islamist militants, though analysts say the gas-rich kingdom is hardly alone in its support for groups with extremist views. The Egyptian-born imam has long been regarded as an agitator by Saudi Arabia, the United Arab Emirates, Bahrain and Egypt, the four countries that severed ties with Doha earlier this month. For decades, Qaradawi's sermons and popular TV show "Sharia and Life" have been beamed into tens of millions of Muslim households, infused at times with harsh criticism of the Gulf monarchies as well as support for the Hamas organization and the Muslim Brotherhood, which all four countries have labeled as a terrorist organization. The cleric has long been regarded as an intellectual leader of the Brotherhood, which won control of the Egyptian government in a democratic election in 2012 and is regarded by Qatar as moderate. "Qaradawi is one of the most public figureheads of the radical wing of the Muslim Brotherhood," said Matthew Levitt, a former counterterrorism official at the FBI and Treasury Department who closely tracked terrorist financial networks in the Middle East. "From the perspective of those who put together the list, this signals a desire for Qatar to take action - not just against terrorist financial networks but against those who support Islamic extremism more broadly." Qatar has defended its most famous cleric while rejecting as "baseless" the allegation that it harbors extremists. Qatari officials in interviews noted that the 59 alleged terrorist supporters include several figures regarded as political or military opponents of the four countries, such as former members of Egypt's ousted Muslim Brotherhood government. Others, officials said, were foreigners with tenuous ties to the kingdom, and still others are believed to be dead. More galling to the Qataris was the absence of any mention of support for extremists by the countries leveling the accusations. Saudi Arabia, in particular, has a long history of promoting its own rigidly austere, Wahabist version of Islam, one that has been embraced by extremist movements around the world. "Our position on countering terrorism is stronger than many of the signatories of the joint statement," Qatar's foreign ministry said in a statement. The International Union Of Muslim Scholars, the Qatar-based theological organization that was founded by Qaradawi and often speaks on his behalf, specifically rejected the inclusion of Qaradawi on the terrorist list, calling the accusations against him "without evidence or proof." For some of the other names on the list, there is less dispute. Even Qatari officials privately acknowledge that illegal fundraising has occurred. They point to a few prosecutions but say a lack conclusive evidence has hampered efforts to obtain convictions. At least six names on the list are currently under U.S. terrorist sanctions, including Abd al-Rahman al-Nu'aymi, a Qatari national and founding member of the Qatar-based Eid Charity. Nu'aymi was accused by U.S. officials in 2013 of being a "terrorist financier and facilitator" who supplied money to al-Qaida-linked groups in Syria, Iraq and Yemen. A Qatari government official, insisting on anonymity to discuss the diplomatically sensitive charges, noted that his government had frozen the assets of several Qatari nationals on the list and restricted their foreign travel, even of the individuals who had been acquitted by Qatari courts of aiding terrorist causes. But the official rejected accusations that some of Qatari organizations on the list illegally raised money. He noted that three of the groups work in partnership with United Nations relief agencies, and another, the Qatar Volunteer Center, is a tiny operation run by a mother of six who raises about $2,700 a month, partly through bake sales, the official said. "She sells cupcakes," he said. "She has no relation to terrorism." The dispute puts the White House in an increasingly difficult spot as arbiter between Gulf neighbors who, despite the increasingly bitter fraternal rivalry, are all strategic allies of the United States. Washington's relationship with Qatar has itself been notoriously complex as the two countries cooperate closely on military matters, even as they bicker over which individuals and groups they regard as terrorists. Qatar is home to the U.S. Central Command and serves as a launchpad for airstrikes against the Islamic State. In recent weeks President Donald Trump has appeared to tilt toward the Saudis, siding with Riyadh in Twitter postings and remarks criticizing Qatar's record on terrorism, even as his aides publicly praised the kingdom for recent steps to crack down on terrorist financial networks. But the concerns about Qatar's role as a financial and ideological base for extremist groups have been shared by Democratic and Republican administrations for at least two decades. Leaked diplomatic cables from the Obama administration show U.S. officials lodging repeated complaints about Qatari organizations and charities, including Qaradawi himself. In a November 2009 exchange, Joseph LeBaron, the U.S. ambassador to Qatar at the time, warned Qatari officials against naming the cleric to a high-ranking banking advisory board, citing his "highly public, regional role" as a supporter of Islamist groups such as Hamas, according to a State Department cable obtained by WikiLeaks. At the time, Qaradawi was banned from traveling to the United States or Britain because of alleged support for extremist causes, and the State Department had formally listed the "Union of Good" - a charity umbrella group chaired by Qaradawi - as a foreign terrorist organization. But Minister of State Ahmed al-Mahmoud pushed back against the complaints, saying Qatar "cannot censure Qaradawi's opinions," according to the State Department's account of the meeting. "As a friend," al-Mahmoud was quoted as saying, "I can tell you that we cannot regard him as a terrorist." It wasn't so long ago that Qatar's neighbors also expressed admiration toward the preacher who some dubbed the "global mufti." In Saudi Arabia, Qaradawi was honored in 1994 with a prestigious award: the King Faisal International Prize, recognizing exceptional achievements to humanity in religious scholarship or the secular sciences. And in 2000, in neighboring Dubai, he was given an international award as the "Islamic Personality of the Year." 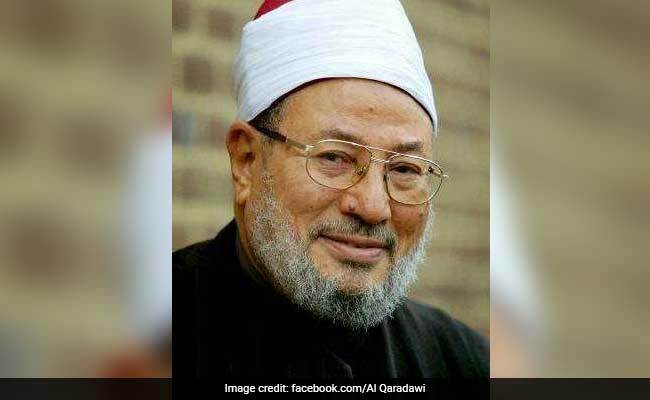 Qaradawi remains popular in many parts of the Gulf, where he is remembered as the spiritual "Dear Abby" who dispensed advice on"Sharia and Life" - his weekly show on Al Jazeera - on topics ranging from the Arab Spring to female masturbation. Millions of Muslims worldwide still regard him as a preeminent Sunni Muslim scholar and the unofficial intellectual leader of the Muslim Brotherhood. That's why Qatari officials tend to regard the accusations against Qaradawi as purely political - a reflection, they say, of the cleric's criticism of Saudi Arabia's Wahhabi strain of Islam as well as domestic worries about his popularity. Qatari officials and many U.S. analysts point to Qaradawi's relatively moderate positions on issues such as democracy and interfaith harmony and strong condemnation of the Islamic State, both the organization and its brutal acts. But Qaradawi's more incendiary statements have drawn condemnations from Western governments as well as Qatar's Gulf rivals. In 2012, France joined Britain and the United States in refusing entry to Qaradawi, in part because of his statements defending the use of suicide bombers to attack Israelis. In the past, he has condoned Iraqi resistance against U.S. troops, and has suggested that the murder of 6 million Jews by Nazi Germany was "divine punishment" for historical transgressions. He has repeatedly called for the destruction of Israel, including the killing of civilians. "Qaradawi has used his TV program to promote a fatwa encouraging suicide bombers, as well as to defend the killing of American soldiers in Iraq as a 'religious obligation,'" Yousef al-Otaiba, the UAE's ambassador to Washington, wrote in an essay published last week in the Wall Street Journal. Whatever sway he does possess is undoubtedly fading. At 91, Qaradawi has retired from television, and his sermons and public pronouncements are less frequent. Yet, his status as Qatar's most venerated imam appears secure. On June 5, the day that the diplomatic break occurred, Qatar's emir, Tamim bin Hamad al-Thani, hosted a number of the country's preeminent Islamic leaders in Doha at an iftar dinner marking the breaking of the daily Ramadan fast. Qaradawi, in his black clerical robe and prayer cap, was photographed sitting in a gilded chair next to the monarch. Then the two embraced, in what clearly appeared to be a choreographed exchange, said David Weinberg, a former House Foreign Affairs Committee staffer and now a Gulf specialist at the Foundation for Defense of Democracies, a Washington think tank. "Qaradawi had pride of place: sitting next to the emir, getting kisses from Tamim, and being held by him, all in front of the cameras," Weinberg said. Four days later, Qatar's neighbors posted its "terrorist" list, naming Qaradawi as among those who "aim to destabilize the region."